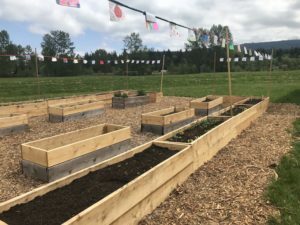 The Harmony Elementary School Garden was built in the spring of 2017 by a dedicated group of parents, teachers, students and community members. The Harmony garden has become a well loved place by the students as they enjoy walking through the garden, nibbling on kale, smelling calendula flowers and looking for bugs in the soil. The local community has generously supported the garden by providing funding in order to purchase building supplies, donating starts for plants in our raised beds and by contributing red wigglers for our worm bins. In the spring of 2018, we doubled our amount of raised beds, built a three bin compost system and installed a wooden work bench for garden classes. Harmony Elementary is located at 5060 Sand Road, Bellingham WA 98225.